EMODnet Chemistry have collaborated with GEOMAR Helmholtz Centre for Ocean Research in Kiel, Germany to process and archive the micro litter ocean data collected during the Volvo Ocean Race. The dataset is now available throught the Data Discovery and Access Service. Since 1973, the best teams of sailors take the challenge of the The Volvo Ocean Race. 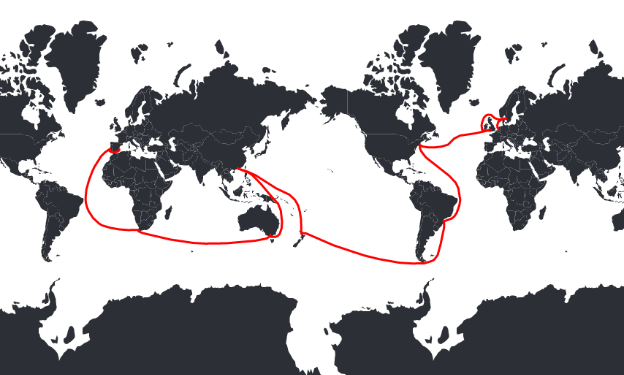 The last edition took place in 2018, starting in Alicante (Spain) and finishing in The Haghe (Netherlands) after 45000 nautical miles of extreme sailing. In this edition, the Kiel Cluster of Excellence The Future Ocean together with GEOMAR equipped two of the participating yachts with sensors that measured oceanographic data and microplastic particles along the race route. Underway ocean measurements are usually taken in oportunity ships, but the sampling on high-speed, racing boats has been a challenge, and the equiptment was especially adapted to be mounted on two of the Volvo Ocean Race participant yachts. Along the race, the boats "Turn the Tide on Plastic" and "AkzoNobel" carried microplastics samplig devices incorporated with a filter system that captured and measured the concentration of microplastic particles from samples of ocean water. With this collaboration, the Volvo Ocean Race has delivered valuable data for marine science. The dataset, unique in extent and reaching remote areas never sampled before, will help scientists in understanding the distribution of microplastics in the ocean. Preliminary results show that microplastics are ubiquitous in the ocean (only 7% of the samples had no microplastics!). The higher concentrations were found in the proximity of the coasts, impacted by high population densities and river inputs. Maximum values were found in western Pacific and Mediterranean regions. For more information, take a look to the race Science Program Report.